Refresh by Cypress Home is known for its high-quality beer, wine, and champagne drinkware options that are ideal for a variety of lifestyles. Whether you're entertaining guests or relaxing at home, we have just what you need to quench your thirst. Our collection includes a vast range of wine glasses, pilsners, and champagne flutes. Designs range from seasonal to everyday and help you showcase your personal style. 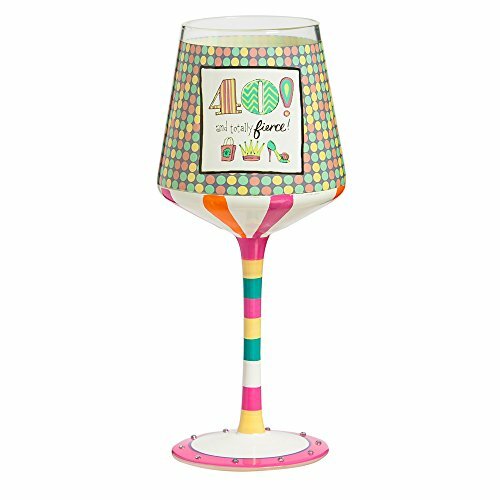 Bold and sassy, this wine glass lets you show off your personality while sipping in style - Perfect birthday gift for a friend or family member - Adorned with bright colors and festive patterns, the glass declares, "40 and totally fierce"